Young Arabs believe that religion is essential to their identity, but also say that it plays too much of a role in today’s Middle East, according to newly released findings from the 2018 ASDA’A BCW Arab Youth Survey. 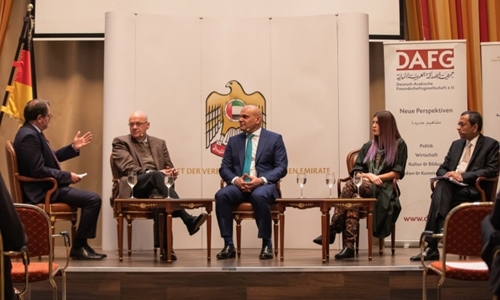 The survey was unveiled at a special German-Arab Friendship Association event hosted by Ali Abdulla Al Ahmed, the UAE Ambassador to Germany, at the Embassy of the UAE in Berlin. Held under the theme “Investing in Arab Youth – Fostering Responsible Leadership” the event welcomed more than 80 distinguished guests, including MPs, diplomats academics and business leaders. In his opening remarks, Ali Abdulla Al Ahmed told assembled guests: “The UAE is a young country, both in terms of when we were established, and in terms of our population. As we move beyond our dependence on our natural bounty of hydrocarbons, it is youth that will be our biggest asset.” New findings from the Survey revealed that youth in the Arabian Gulf states are more likely to see religion as key to their identity, with 89 per cent agreeing with the statement ‘my religion is central to my identity’ compared with 74 per cent of those in the Levant countries, comprising Lebanon, Jordan, Iraq, and the Palestinian Territories. However, perhaps surprisingly given the importance of religion to their identity, twothirds (68 per cent) of youth in the Gulf Co-operation Council states (GCC) agreed with the statement ‘religion plays too big a role in the Middle East’ – compared with just 56 per cent in the Levant.